Apollo 16 is the flagship of Universal Audio’s acclaimed Apollo recording interface range for Mac and Windows — giving professional and commercial studios UA’s finest A/D and D/A conversion with the tone, feel, and realtime workflow of classic analog recording. Built upon UA’s 60-year heritage of audio craftsmanship, Apollo 16 distinguishes itself with 16 x 16 analog I/O, onboard UAD-2 QUAD Core processing, and an included bundle of award-winning UAD plug-ins — which you can track through with near-zero latency, shaping sounds like a classic analog studio — without taxing your host Mac or PC. The original Apollo interface quickly became a gold standard among modern music producers and engineers, tracking literally hundreds of hit records. Apollo 16 improves upon this studio standard with completely redesigned, class-leading A/D and D/A conversion — offering 2 dB better A/D and 8 dB better D/A dynamic range versus the original Apollo. Tuned through an obsessive auditioning of converters and double-blind listening tests, Apollo 16’s sound quality is extremely open and natural, rivaling or exceeding dedicated mastering-grade converters costing thousands more. Right out of the box, Apollo 16 provides a suite of incredible analog emulation plug-ins including the world’s only authentic Teletronix LA-2A, 1176LN, and Fairchild compressors, the legendary Pultec EQs, and the UA 610-B Tube Preamp. Developed by UA’s world-renowned team of algorithm engineers, these Realtime Analog Classics plug-ins set the standard by which all other hardware emulation plug-ins are judged. With exclusive emulations from Neve, Studer, Manley, API, Ampex, Lexicon, Fender, and more,* it’s like having an endless analog studio, in a single rack space. And unlike competing interfaces, these DSP-powered plug-ins are also available in your DAW for mixing. Apollo 16 is the ideal interface for professional studios, offering 16 x 16 analog I/O on DB-25 connections — twice the analog connectivity of the Apollo 8/8p models — plus L/R monitor outputs and AES/EBU digital I/O. This makes it perfect for pairing with mixing consoles or other outboard processors at the center of a modern studio. When it’s time to expand, Apollo 16’s dual built-in Thunderbolt ports allow you to add up to three additional Apollos and six total UAD-2 devices — for a networked system with 64 x 64 simultaneous analog I/O and 32 cores of UAD plug-in processing. 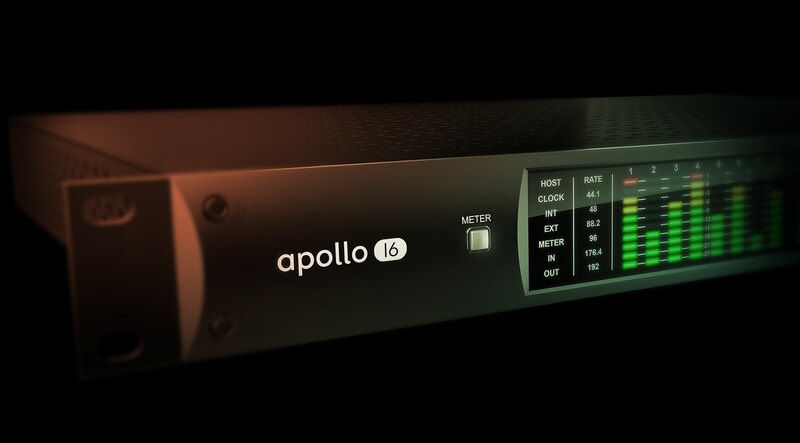 Apollo 16 also provides seamless integration with previous generation Apollos over Thunderbolt. With Apollo 16’s Console 2.0 application — a complete re-imagining of Apollo’s original Console software — you can take advantage of over 25 new user-requested features such as Channel Strip presets, Drag & Drop functionality, dynamically resizable windows, and more. *Apollo 16 includes the “Realtime Analog Classics Plus” UAD plug-in bundle. Other UAD plug-ins sold separately. I love my Apollo 16, I actually just ordered a second one. It sounds great and I like having the DSP, I wish it had an OCTO option but other than that I have no complaints about it. †Apollo 16 includes the “Realtime Analog Classics Plus” UAD plug-in bundle. Other UAD plug-ins sold separately. If you're considering anything else you really need your head examined. This is as PRO as gear can get! and it's build for the future! Buy it and you'll never look back. I replaced an entire rack of outboard gear with two Apollo 16's...These things sound amazing! The reviewer complaining about the lack of DSP must be talking about something other than Apollo..
Hoje tenho uma apollo quad 16 e um Satellite quad, foi o melhor investimento que fiz no meu Estúdio, depois de alguns anos comprando pre e sempre trocando de interface, hoje com apollo conseguir chegar no som que eu sempre sonhava,um som limpo e transparente e grande !!! Internal DSP is simply not powerful enough to power GOOD sounding plug ins. Can only run 8 Neve 1073 in TOTAL before it starts disabling plug ins. Not well thought out in this regard and not internally upgradeable. PLUS, satellite systems added to it do NOT correct this. Do your homework is all I say. a non-usable madi port, no dante either... why?? this could be a great unit to bring in for live shows, but without any usable connections it's just a big disappointment. why are you doing this, uad?? I just wanted to by two of this lovely Units. But its only for MAC and I´m on a PC. I bought an Apollo 16, sealed in the box, brand new. Got it home and there was damage on the face plate. UA denied it took place on their end, and called me a liar. I also didnt receive a thunderbolt card with my Apollo, and was treated very rudely by their "customer support" when I asked about this. Avoid this product and company like the plague, there are too many better options out made by companies who care about their customers. Plugins are ok but not worth the money or hassle of dealing with this company. The overall sound of this unit is amazing! I’ve have had a number of other brands over the years and it is like someone took a blanket off the mix with the Apollo , and this is before even touching the plug ins. Plugins: if you’ve bought a uad plugin package, definitely take time to demo the available options (14 day demo of all plugins included.) BEFORE you pick. The included plugins by themselves are great, too! I feel the uad plugins are much better than others out there. Console software: this is the interface with the hardware. It needs some help. No midi control, so you are stuck mousing around. The lay out is not very flexible and the patch bay is beyond confusing.. I have a softube console 1, which helps but the intergeration still leaves a lot to desired. Overall I’m glade I purchased this unit as it sounds amazing, and I’m sure my frustrations with the software limitations will pass in time as i find work arounds for it.. The Apollo 16 does what’s supposed to do. The plugins included are top level. The converters sound terrific, the routing is amazingly flexible and the build quality inspires confidence. The integration with my existing projects and studio was easy - up and running in just a few hours. Great product! My apollo 16 is running great,I get back to U when Ive learnd more.Thank U sofar. This interface just makes the most sense. The Console software is intuitive. It allows for no latency tracking and monitoring with effects and this is incredibly valuable. I've had an apollo since 2013 and have no plans on switching. Thanks for making such a wonderful product that causes zero frustrations or setbacks when recording or mixing.